Life on Earth may seem safe from space, but every minute, high-energy particles bombard our atmosphere and travel freely through almost every material here on Earth, including our skin! Though the particles are common, most do not make it through the atmosphere. The sources of these are called cosmic rays. Cosmic rays are charged sub-atomic particles (protons, electrons, or atomic nuclei) that originate from supernovas, exploding stars. These particles then collide with our atmosphere, resulting in particles getting knocked off of these atmospheric particles, thus causing ions. Ions are any molecule, or atom that loses or gains electrons, so it then carries a net positive or negative charge. They are looking for any other atoms to latch on to. This causes them to either collide with other atoms, breaking off that atoms particles, or bond with atoms it usually would not, which in turn leads to a mutated atom. This process of knocking off electrons and other small particles from elements in the atmosphere leads to a shower effect. As particles are knocked off atoms by the primary sources, cosmic rays, these now fast moving particles collide with other atoms, thus knocking off more electrons, and so forth until the bottom of the atmosphere. However, by the time this process reaches the bottom of the atmosphere, the particles lose speed and are now less penetrating and therefore less damaging than the cosmic rays. Figure one shows this process in a somewhat simple way. As the cosmic rays collide with the first atoms in the atmosphere, the electrons start the chain-reaction shower. 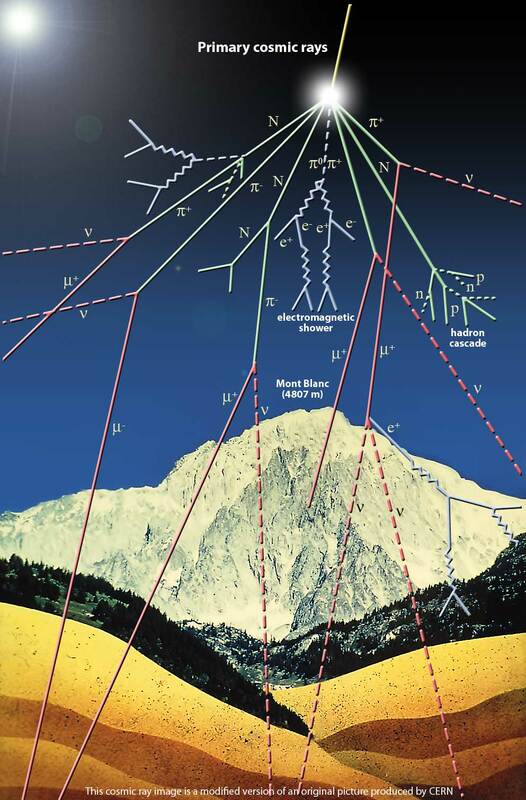 The yellow line is the path of the original cosmic ray, after first colliding with a molecule in the atmosphere it breaks the molecule up into pieces, whose paths are shown by the green lines. The red lines show the result of the broken molecules colliding with additional molecules. It is much like striking pool balls with a cue ball at the beginning of a game. The cue ball strikes the front ball, and that front ball strikes the ball behind it and so on resulting in all the balls scattering in all directions. As a member of the Adler’s Far Horizon Team, I had the opportunity to launch in experiment I designed to measure cosmic ray radiation levels at different layers of the atmosphere, closer and closer to the primary source. 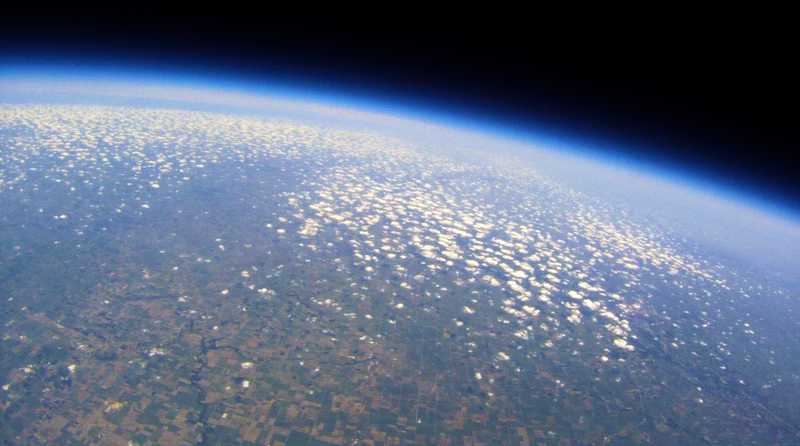 The experiment was launched on a high altitude balloon (HAB) up to around one hundred thousand feet, above nearly 99% of the atmosphere. Up there, the radiation levels are much higher than what we can expect here on Earth’s surface. For this experiment, a Geiger counter was used to measure radiation levels. A Geiger counter detects radiation by ionization produced in a low-pressure gas in a Geiger–Müller tube. Each particle detected produces a pulse of current which the Geiger counter records and stores as a “count”. Graph one shows the relationship between time into the flight and amount of radiation measured. It clearly shows that as time progressed, and altitude increased, the radiation increased, and as the radiation goes down, it shows that there is less radiation measured on the trip back down. The X- axis is the time into flight and the Y- Axis is the amount of radiation counts detected. The colored dots represent radiation counts taken while being shielded by different materials. The solid black line is the average of all radiation counts. Without our atmosphere, all of these cosmic rays would be moving at high speeds, with little opposition towards us delicate humans. As we are exposed to these dangerous particles, all cells would be potentially harmed and bonded to unnatural particles, which could lead to health issues such as cancer. Our atmosphere acts as a little shield, protecting us, and keeping Earth within a safe level of radiation. 1. According to around 100,000 feet, what would be the expected radiation levels? 2. What are possible outcomes to high radiation exposure? 3. What are the primary sources of cosmic rays? Extrasolar planets, or planets that orbit stars other than our Sun, are found using various indirect methods. It is harder to find a planet than to find how that planet interacts with its star. For example, if you are looking for a fly on a headlight, you only see the headlight; however, if you study the headlight closely you could see a drop in brightness if the fly is interacting with the headlight. One popular method to use on finding extrasolar planets is the transit method. The transit method is based on the observation of a star’s small drop in brightness, which occurs when the orbit of one of the star’s planets passes, or transits, in front of the star. It determines the size, or radius, of the planet. When the planet orbits around its star, scientists can measure the reduced brightness of the star and determine the size of the planet. It determines the size of the planet because scientists know the brightness of the star. If the extrasolar planet was the size of the star you would see little or no light , and if the extrasolar planet was smaller and only took up a portion you would see more light, but not as much as before. The Kepler Space Telescope is completely devoted to using the transit method to find extrasolar planets. So, how do scientists know they are not seeing space junk in place of seeing an extrasolar planet? They know this by making sure the drop in brightness is there every orbital period, or period it takes an extrasolar planet to orbit its star. This method can be used to isolate certain characteristics of the extrasolar planet. If we can combine detection methods, we can find out more information on the planet. Using the transit method and other detection methods together we can move forward in learning as much as we can about the extrasolar planet. The transit method is described in the figure above. It shows how the extrasolar planet crossing, or transiting, the star. The graph shown under the figure, shows you how the placement of the planet effects the brightness shown from the star. The y- axis, or brightness, shows the amount of light emitted by the star, and the x-axis, or time, shows how that light emitted is affected over the time the star is being observed. 1. In the figure, planet phase 1 does not affect the brightness. Why does this happen? 2. When would the light curve change and go back to the original brightness? If the Sun produces more light and heat it will affect Earth greatly. The Sun contains enough hydrogen to last ten billion years. The Sun needs all the hydrogen because it nuclear fuses hydrogen atoms together in its core to make helium which produces energy. The outward pressure created by the energy emitted from the fusion cancels out the inward pull of gravity, this is how the Sun stays stable. Once it runs out of the hydrogen in the core, it will go through changes where it will start fusing hydrogen in the outside of the Sun and will release more heat and light. The Sun goes though many phases as it begins to burn hydrogen outside of the core. Over time the Sun will begin to get larger and will start to change colors. It gets larger because the hydrogen being fused is producing greater energy than the gravity, when this happens the Sun will be known as a red giant. This phase also causes the Sun to turn a dark red-orange, which is where the name ‘red giant’ comes from. This phase of the Sun could really affect the fate of our solar system. Figure 1 shows how the luminosity, which is the energy from the Sun, changes over time as the Sun approaches the red giant phase. The dotted line represents where we are at currently in the Sun’s lifetime (we are currently at the 4.5 billion years point). In the 8 billion year point the luminosity is roughly 1.5 times greater than the Sun currently is. The figure ends at 10 billion years because there is to much dramatic stuff happening to record when its at the red giant phase. Since the Sun is producing more energy it will overheat the Earth which means the water on Earth will evaporate. This evaporation will happen before the red giant phase and most likey in the next 1 billion years. If the Sun grows too large in the red giant phase we, Earth, would be “in” the Sun (which means destruction of the entire Earth). Besides Earth getting dried up or destroyed, Mercury, Venus, and Mars also will be burnt and/or obliterated. The other outer planets will also get warmer due to the power of the “new” Sun. That could affect the climate of these planets and their moons as well, such as a very cold planet could become a new, cool or warm one because of the extra heat. Some of these places would become livable environment for mankind, if we survive for that long. 1. In figure 1, in the year 10 billion what is expected luminosity to be at? 2. What is the source of energy of the Sun after the core runs out of hydrogen? 3. What is are the two outcomes of the Earth as the Sun changes, which would happen first? For years, all of humankind has looked skyward towards the next frontier: space. For the most part, life would be terrible in space! Other galactic bodies such as: planets, moons, and asteroids rarely have habitable environments for life. Scientists have been finding some locations, other than Earth, that may be suitable to sustain life. These places have similar conditions that can be found on Earth such as temperature, water, sunlight, and oxygen. These conditions are known to be necessary for life to thrive. Europa is a moon that was first discovered 400 years ago by Galileo Galilei. It is a moon that orbits Jupiter, which is the fifth planet from the Sun. Jupiter is more than twice as massive as all the other planets combined! Today, Europa is a useful location used in understanding the habitability of icy worlds. Europa is believed to be have internal salt-water oceans that may be within the spectrum of habitability. Evidence of these near surface bodies of water have been discovered by missions including: Galileo, Cassini, New Horizons, Juno and the Mars Reconnaissance Orbiter. However, the surface of Europa is too cold for water to stay in its liquid form. However, the center of the planet is very warm and can melt the ice above, thus creating a subsurface ocean that covers the entire moon. This warm water then seeps up, heated from the planet’s mantle below, and breaks the surface ice into a jumble of large icebergs. The icebergs then flip, float and freeze in place. This is why the surface of Europa appears chaotic, with icebergs, cracks, and gigantic ice formations roughing over the would-be smooth surface of Europa. Meanwhile back on Earth, Antarctica has over a hundred subsurface lakes much like Europa. One of these lakes, Lake Vostok, may be a possible home for exotic life on Earth and provides a location on Earth to do background research on these environments prior to scientists launching experiments over 600,000 kilometers through space. To prevent drilling fluid from reaching the lake water, scientists plug the bottom of the borehole with a fluid known as Freon, which does not react with water and does not affect the water samples. Pressure is released in the lake and then the lake water flows up the borehole, then freezing and forming an icy plug, protecting the water samples. The Freon is forced back up the drill as a way to protect the samples. If scientists were to find an abundant amount of life in Lake Vostok, they can form a realistic prediction that life will be present on Europa. 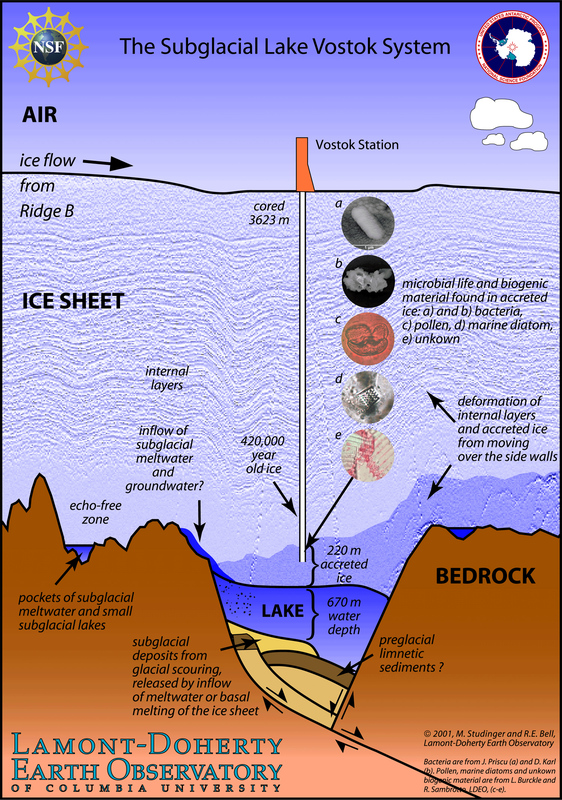 Figure one shows different forms of life that the drill found in the ice above the lake. This shows that there is a very good chance that there may be life in the lake. For example, scientists have found evidence of life such as bacteria and marine diatom, a group of algae, and one of the most common types of phytoplankton. Figure one also shows the three different layers that the drill passes through as it bores towards the bottom of the lake. All of this science leads to one pretty exciting idea. Life on other planets! This could mean that we have neighbors waiting for us to pick them up on our next rover mission. This is a very complex experiment, but astrobiology is based on experiments and knowledge we gain here on Earth in order to accurately guess what the chances are that life is out there. 1. What layer of the ice did scientists find evidence of life: the ice sheet, the accreted ice, or the lake? 2. How do scientists insure that the drilling equipment would not contaminate the samples they take from Lake Vostok? 3. Based on figure one, what evidence of life has been found besides evidence of marine life and of bacteria? The habitable zone is described as the region around a star where a planet can maintain liquid water on its surface. In order to have liquid water, the star has to be at the right distance. If I were in a cold place like Antarctica and I had a cup of hot cocoa and a campfire, I would have to be by the campfire for my hot cocoa to stay a liquid, if I were to go too far away from the campfire my hot cocoa would become ice. It is the same for stars, the planet has to be in the right location relative to the star, so that the liquid on the planet would not freeze or boil. Different stars have different brightnesses, meaning, stars have different locations for the habitable zone . To see why different stars have different habitable zones think of a bonfire and campfire. A bonfire is bright and warm, whereas a campfire is less bright and not as warm. If you were 3 ft away from a campfire you would be comfortable, but if you were 3 ft away from a bonfire you would be very hot, for you to be comfortable you would have to be further away. The graph below shows on the y-axis the brightness of a star relative to the sun meaning the lowest mass would be a campfire and the highest would be the bonfire. 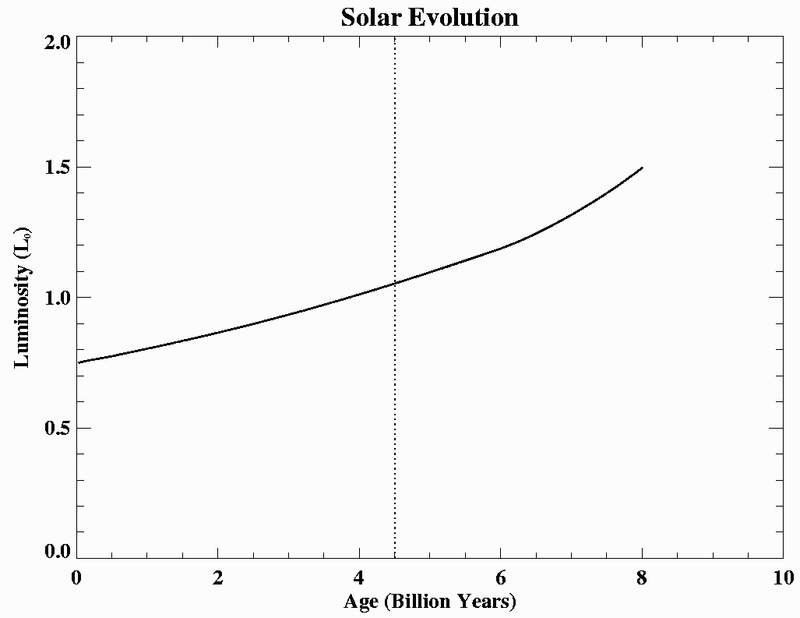 The x axis is the distance from the sun. As shown below Mars is out of the habitable zone because it is too far away from the sun, Venus is too close to the sun, and the Earth is right in the middle meaning it is in the habitable zone. Astronomers often use this definition as a habitable zone, but a planet’s distance is not the only factor affecting its temperature. An atmosphere also effects a planet’s temperature. A campfire does not only keep you warm but the type of clothing you are wearing also affects your warmth. If you were wearing a parka you would be warmer v.s. wearing a t-shirt. This is because the heat from your body would become trapped inside of the parka. A planet’s atmosphere works the same way, the atmosphere traps the planet’s heat that it releases, this is known as the “greenhouse effect.” If we were to have too much atmosphere here on Earth we would be become very hot and if we did not get enough we would become very cold. 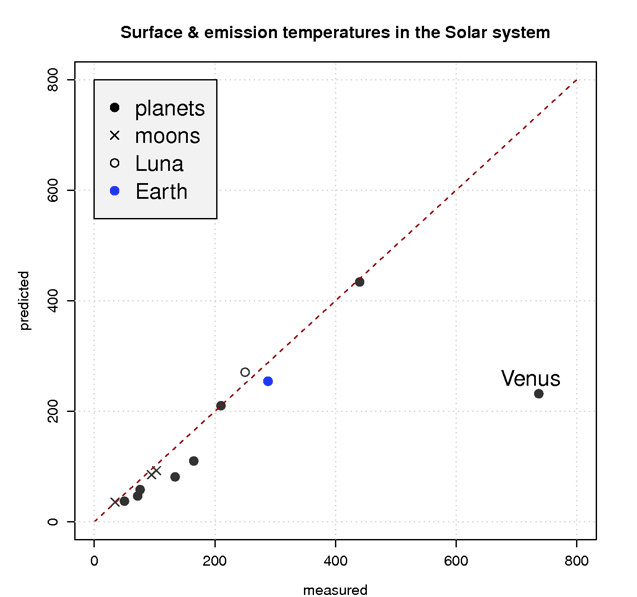 The graph labeled ‘Figure 2’ shows on the y-axis the predicted temperatures a planet should be at if a planet’s temperature just depended on the distance from the Sun. The x-axis shows the actual measured temperature for the planets. The red line on the plot tells where a planet temperature should be at, if a planet is on the red line then the predicted temperature matched the measured temperature. Venus and most of the planets lie to the right of the red line meaning they are hotter than predicted. Venus is much hotter than predicted to be, this is because Venus has a 100 x the greenhouse effect of Earth. For example, if Earth was wearing one parka Venus would be wearing a hundred parkas. The fact that most planets are hotter than predicted proves that the temperature of the planets does not only depend on the distance from the sun (it also depends on the atmosphere). 1. Why Were the parkas and t-shirt used as an example in the text above? How did it relate to the topic being explained? 2. 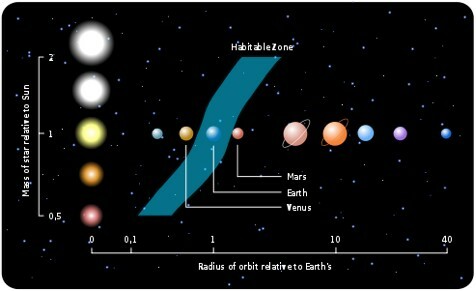 In figure 1 would Venus be considered to be in the habitable zone? Why or Why Not? 3.In your opinion, why do Astronomers often assume the habitable zone depends on a planet’s distance if that is not the only key factor? Traveling to space is every kid’s dream. Something about being in a rocket moving faster than you could ever imagine, wearing a cool space suit, and seeing stars up close is so appealing; or maybe it’s the dream of tasting our cheesy moon. Whatever the reason is, when we grow up and learn more about space, we realize space isn’t as glamorous as we thought it to be when we were children. We learn that space travel takes a lot of preparation and patience. So before deciding to become an astronaut, you should consider some very important details such as how long it takes to travel space and very serious health conditions. What is a rocket? The word ‘rocket’ can mean many different things. Most people think of a tall, thin, round vehicle. They think of a rocket that launches into space. “Rocket” can also mean a type of engine or a vehicle that uses that engine. Whichever way you may think of rocket, they basically all work the same way; they all use Newton’s third law: for every action there is an equal and opposite reaction. The fuel pushes out fire and the force from the fire pushes the rocket upwards. As you can see in Figure 1, NASA’s space shuttle, Endeavor, follows this law. One very important thing to know when traveling space is the distance from the starting point to the destination. For example, if you hitch a ride on Endeavor and take a ride to the Sun it will take you about 5357.1 hours, which is about 223.2 days. Endeavor travels at an average speed of 28,000 kilometers an hour and the Sun is about 150 million kilometers away, therefore equaling 5357.1 hours. But what about something farther? This time we will travel to the nearest star to our Sun which is Proxima Centauri. Proxima Centauri is about 39.9 billion kilometers away from Earth. Assuming we use Endeavor again, it will take about 142.5 million hours, which is about 59.375 million days or 160,000 years, to reach this star! Figure 2, below, shows the time it take to travel from Earth to different objects in space. Each dot refers to a different object in space; Mars, the Sun, Pluto, and Proxima Centauri. So you can see from the graph below that Mars will take less than a year to travel to, which is a very reasonable destination to travel to, unlike Proxima Centauri. Mars is about 75314905.8 km away from Earth. The Sun is about 150000000 km away from the Earth. Pluto is about 5913520000 km away from the Earth. Proxima Centauri is about 39900000000000 km away from the Earth. Even though traveling to space may seem amazing, there are many health risks to be aware of before strapping on the seat belt of that cool rocket ship. Even though the Extravehicular Mobility Unit (EMU), also known as space suits, are made to keep the astronauts as safe as possible, there are many other factors that the space suit cannot help with. First of all, everyone knows there is no gravity in space, but what people don’t know is that the lack of gravity isn’t just the thrill of floating but it possesses many health challenges. Here on Earth, gravity pulls us down as well as all the fluids in our body. In space, those fluids are released from their gravitational pull and move upwards toward your head. When all the fluids reach your head it expands your face creating ‘puffy face’, and when the fluids escape your legs, your legs begin to shrink creating ‘bird legs’. Another health risk due to the lack of gravity is motion sickness. Motion sickness is caused when the brain and inner ear receive mixed signals. 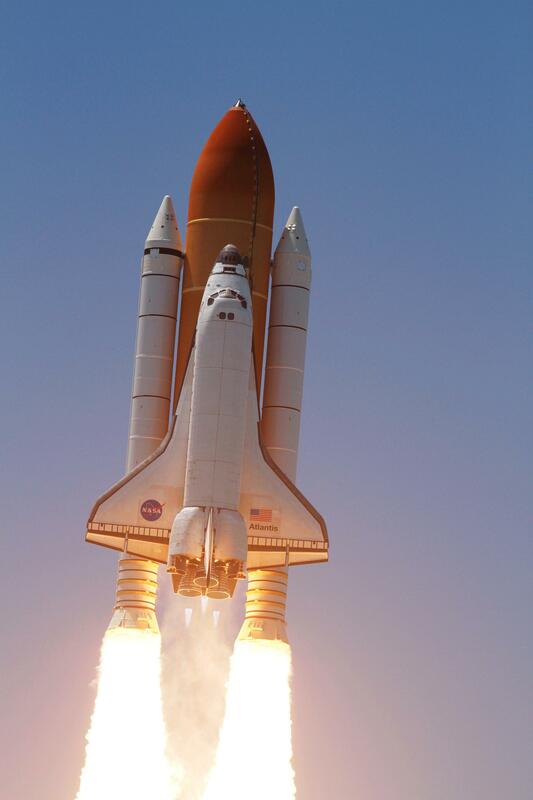 In a space shuttle the astronaut can obviously see what direction is up and which is down, but his or her inner ear cannot. On Earth, the sensors in the inner ear feel the gravitational pull, but without gravity the inner ear cannot detect which direction is which. A few other health risks include stress, loss of muscle mass, and radiation exposure. So next time you dream about traveling to space, think about how long you are willing to be in a space shuttle and the many, many health risks you are likely to face. 1. Describe ‘puffy face’ and ‘bird legs’. 2. 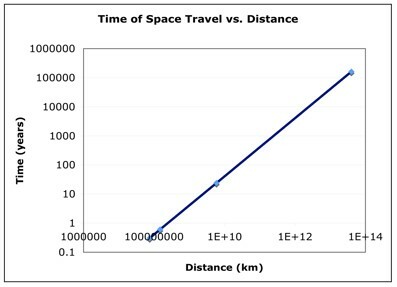 According to the data in Figure 2, how long will it take, in days, to travel from Earth to Pluto using Endeavor? Keep in mind that Pluto is about 5.91352 billion kilometers away from the Earth. 3. Explain Newton’s third law and how it is used for space travel.